Leakers at enthusiast forum The Mobi Zone have loosed a set of new images and specs for what they say is the sequel to the big daddy of the Droid family, the Droid X. According to the info, the new Droid X 2, or, aptly, the Droid X "squared," sounds a lot like the old Droid X. 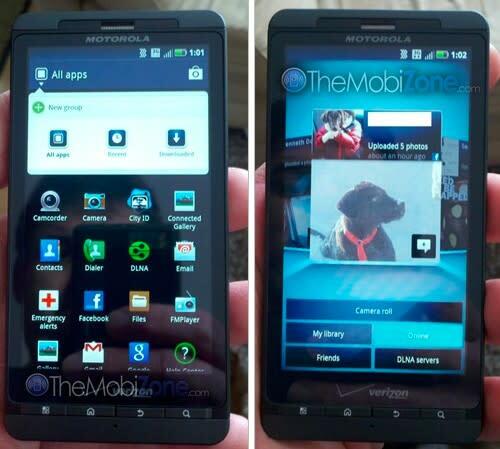 It will feature the same tall 4.3 inch screen, 8 megapixel camera and Android 2.2 with MOTOBLUR, not Gingerbread. The internals do get a boost with a 1 GHz Tegra 2 dual core processor and 1gb of RAM. The Droid X2 will be 3G only, not LTE, and is expected to come out in the second quarter of this year. Sounds like Moto&apos;s giving the Droid X a little refresh, but nothing too earth-shattering.